Another new route for the Latvian government supported airline airBaltic was launched today, on March 31, 2019 from Riga to Dublin. The new flight will be operated on the carriers Airbus A220-300 aircraft and will go head to head with a service from budget carrier Ryanair. The airBalticservicee will operate four times each week, with fares starting as low as €39 one way. 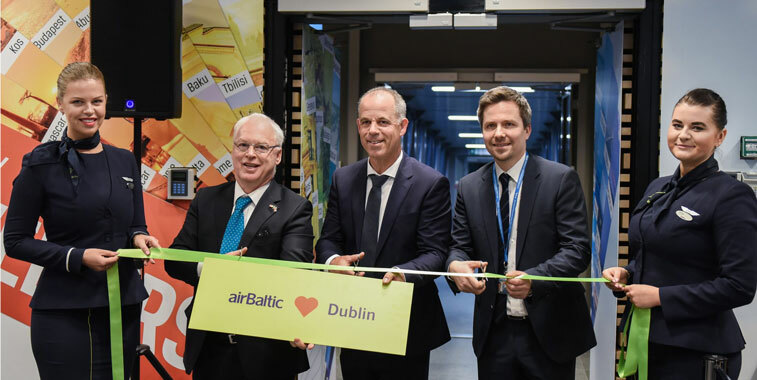 Chief Executive Officer of airBaltic, Martin Gauss said: "We are happy to start our summer season schedule by launching a long-awaited and highly demanded connection between Riga and Dublin. Now travellers between the two cities will have a great flying experience with very attractive prices in economy or our full-service business class on the new Airbus A220-300 aircraft." airBaltic allows passengers to take on a free cabin bag as well as a personal item as long as it weighs under 8kgs. Passengers can up that limit to 12kg with a heavy cabin bag fee of €9 and checked baggage fees start at €19.99. Earlier in the week, the carrier took delivery of its 16th Airbus A220 aircraft, registration YL-AAP, the first Airbus A220-300 received this year and seven more new aircraft will join the airline’s fleet by the end of the year.